His MVP case: No Hayward, no Horford, no problem for the Celtics’ new resident superstar. Irving guided his crew to their 10th consecutive win (over the Los Angeles Lakers Wednesday in Boston) without his All-Star counterparts. It wasn’t Irving’s best shooting effort (7-for-21 from the floor, 0-for-7 from deep). But make no mistake, he was the steady hand the young Celtics needed to finish off yet another tightly contested game. 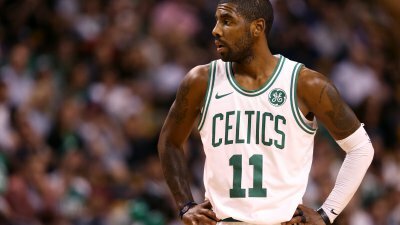 Irving is blending in beautifully, sharing the ball and making plays for his young teammates, while maintaining his status as one of the league’s great closers (see his work in Atlanta Monday night). His effort to make a seamless transition should not be overlooked, given all of the opportunities he’s had to freelance and go off script early on this season. No one appreciates his leadership more than Celtics coach Brad Stevens and youngsters like Brown and Jayson Tatum. Irving's last NBA rating for MVP was number eight, and now he is rated second. The Bus Driver has driven the Celtics team to the best record in the League, and he has done it the right way. These latest ratings seem very solid to me. Harden deserves to be first, but that could change with Chris Paul's return to action. Stephen Curry ranked third, and Giannis Antetokounmpo and Kristaps Porzingis ranked fourth and fifth, respectively, makes sense. “Baynes-ey is just big and wide so he hurts whenever he sets screens,” Manu Ginobili said. “He’s not easy to avoid because he has a wide base and he’s thick. Kyrie Irving chose the right bus to ride, and Danny Ainge chose the right guy to drive it. That bus may very well be headed to the NBA Finals and beyond. But the riders may need facial protective devices, even during practice. "Baynes-ey" plays hard all the time, and that's why we love the guy. Our rising MVP candidate should be back soon. We need our driver back.